The Center is one of only about 30 National Institutes of Health (NIH) designated Alzheimer’s Disease Centers in the United States, a designated Alzheimer’s Disease Research Center, and one of 24 Lewy Body Dementia (LBD) Research Centers of Excellence, helping to advance LBD care, community outreach, and connecting patients with the latest LBD clinical trials. Our doctors lead a multispecialty team of health care professionals working together to provide accurate diagnoses and guide treatments. Experts from the fields of neuropsychology, psychiatry, nursing, pharmacy, and genetic counseling collaborate closely with our behavioral neurologists, allowing them to provide medical care that is both leading-edge and compassionate. The Stanford Center for Memory Disorders is one of only about 30 National Institutes of Health (NIH) designated Alzheimer’s Disease Centers in the United States, as well as a designated Alzheimer’s Disease Research Center. The Center is one of 24 Lewy Body Dementia (LBD) Research Centers of Excellence helping to advance LBD care, community outreach, and connecting patients with the latest LBD clinical trials. Memory Loss: What is Normal Aging? 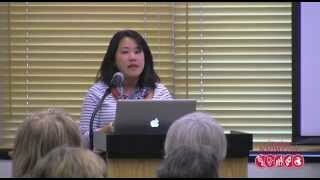 Neurologist Sharon Sha, MD, discusses dementia and aging at Stanford's 5th Annual Women's Health Forum. Call us to make, change or reschedule an appointment. Bring your completed New Patient Questionnaire, if applicable. Bring someone who knows you well, such as a spouse, child, caregiver, or close friend to your appointment. Any patient with a progressive neurological syndrome that includes cognitive or behavioral symptoms is appropriate for referral. The earlier you refer a patient, the better. Patients with mild cognitive impairment may benefit the most from diagnosis and treatment, especially as emerging therapies become available. We see patients for one-time consultations, second opinions, and for longitudinal care. Call us at 650-723-6469 to refer a patient. Before we see a patient, it is helpful (but not necessary) to test thyroid function (TSH and T4) and serum B12, and to have obtained magnetic resonance brain imaging. Any prior brain imaging (films or CD) should be hand-carried to the appointment.